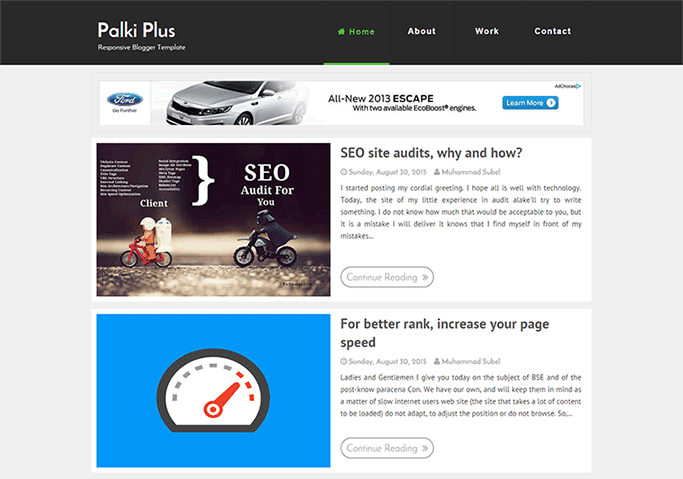 Palki Plus is clean, responsive, modern and SEO Optimized personal blogger template for blogging. Palki Plus Blogger Template give you a professional blog idea for making a professional blog, portfolio and elegant website with blogspot. You may use this template in any commercial use, because is has some responsive ad slot in standard position. Palki Plus blogger template designed to showcase your content in an effortlessly timeless style and is very important that you can share post type to social media like Facebook, Twitter and etc with easily. Equipped the documentation is easy to read and understand. It have easy and powerful admin panel for better and easiest customization. Palki Plus blogger template is totally responsive designed blogger template so that adapts to your style as well as the device it’s viewed on. It compatible with all devices. It is clean and fresh style and high user friendly blogger template. SEO is most important part of template design. MS Design always focus on SEO Optimization when design a unique template. Palki Plus isn't progressed beyond from SEO Optimization. This template up to 100% SEO scored. See The below screenshot. First time in this template we used Author bio box with "Verified Icon" that may give your blog extra professionalism look. This Author box work with Google Plus profile. Profile picture, Profile name and description will show in this box that you used on your google plus profile. But Social icons link have must edited with your social links like, Facebook, Twitter and Google Plus. See the below screenshot. Awesome footer section with social icons. You can put your logo and set your social media links in footer. This section may increase your blog's beauty. For adding footer logo you don't need go to the HTML section. You could add this footer logo by uploading form blog layout. See the below screenshot. bro i am still waiting for ur post for that How to Use Blogger, Disqus and Facebook Comment tab Together on Blogger blog? free version not show comment delet button ?